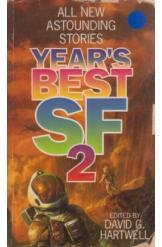 Years Best SF 2 by David Harwell, book in a good condition. All pages intact. All new astounding stories. Authors include Gregory Benford, Terry Bisson, James Patrick Kelly, Damon Knight, Joanna Russ, Bruce Sterling, Connie Willis and many others.